Born in Canicattini on 6-26-38, Joe emigrated to the USA in December 1954 and moved in with an aunt in New Britain, CT. Joe was eligible to emigrate as his mother was a U.S. citizen . The initial years were difficult ones and Joe, being only 16, had a difficult time finding a job. Thanks to the effort of his cousin, he was finally able to land a position with a manufacturing firm where he did all kinds of work and where he received very valuable training from the Polish women who mostly worked there. In 1959 he joined Sterling Machinery: Joe was loved and treated like a son by one of the owners. He took Joe under his wing and mentored him for over six months in all aspects of machining. In 1960 Joe met his wife and will have three children. In 1961 Joe was hired by a small firm, Ajax Machines and was named general manager shortly thereafter : in a period of 6 years he grew the company from 3 to 20 employees. In 1968 Joe began his efforts at opening a machine shop of his own: these were also difficult times! He could not find a suitable building for his machines! He finally accepted space at his old employer Sterling Machinery but heavy reliance on one primary customer and the loss of orders from that customer due to the end of the Vietnam War dealt a serious blow to Joe's company and he shut it down. In the mid 1970's Joe found himself working once again for Sterling which had been sold to a large national company. He signed a 3 year contract ( they wanted to sign him for 10 years, he refused) . He was well paid and well liked but his aspirations of his own company prevailed. 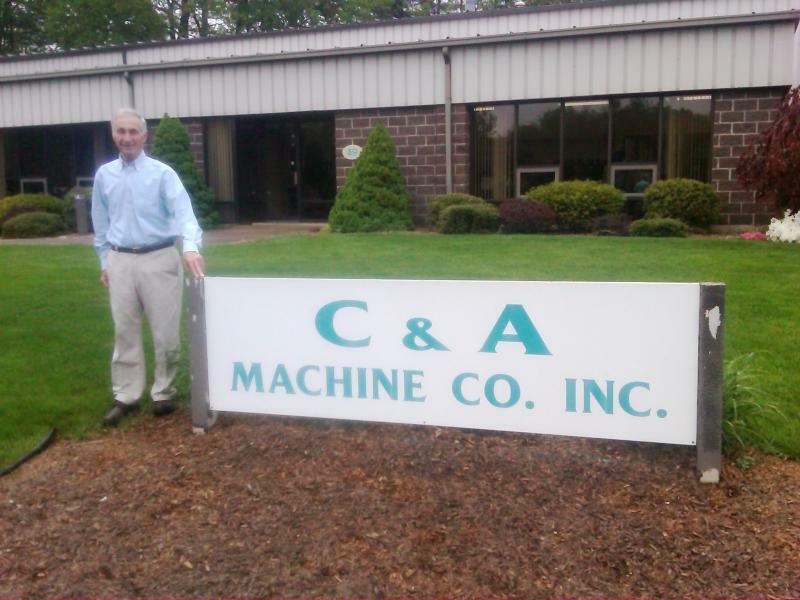 In 1980 he and a friend formed C & A Machines, and for a while Joe worked two jobs! His own son Joe also started working at this new firm. Eventually Joe quit his job and started devoting his full time attention to C & A. The company has grown over the past 30 plus years from 2 to over 50 employees! Hard work, perseverance, doing the right thing have been and continue to be Joe's guiding principles! He has returned twice to his native Canicattini, in 1977 and again in 2011. Joe is the proud grandfather of 6 grand-children! Joe in front of his company's headquarters in Newington, CT.